Over the last six years I have been working on turning poems by two dozen fantastic American poets into indie-rock free-verse songs. The record that resulted from this project is called Pink Thunder. Happily and at long last, today is the official release date! There’s 12″ vinyl and digital from The Kora Records, and a pink vinyl 7″ from Howells Transmitter and Black Ocean. And for those of you in the Bay Area, the record is also available in portmanteau form. Portmanteaus combine a found object display with a digital music player. I made them (Mark Allen-Piccolo designed the music-player circuit). The Curiosity Shoppe in San Francisco will be showing the Pink Thunder Portmanteaus from October 18th to November 18th. There an opening party on October 18th from 6-8 pm. Please come! We are booking shows around the US over the next few months. We’ll be at the Mission Creek Music Festival in Iowa City in April, and in Boston in March to play at AWP. More shows to be announced soon! In the meantime, the San Francisco release show is November 18, just after the closing party for the portmanteau art show at the Curiosity Shoppe, at Amnesia. That’s an early show, from 7-9pm. You can buy the pink vinyl 7″ from Howells Transmitter here. Pink Thunder 7″ Test Pressings! Test pressings for the four-song Pink Thunder 7″ arrived this week. This is the first music I’ve ever had pressed on vinyl, and I’m excited! These test pressings are black vinyl, but the real things will be pink. I’m finding that evaluating test pressings is hard. You have to listen to every pressing and make a note of anything iffy that you hear (pops, surface noise, distortion etc). Then you have to compare that part of the music with all the others. If you hear the same flaw on all the pressings, then it might be a flaw in the original cutting. If that’s the case, that side will have to be re-cut. But, if you hear anything that might be a flaw, you have to repeat the process on someone else’s turntable and system just to make sure. It’s kind of like having Kurosawa’s Rashomon playing in my head constantly. It’s fantastic to see and hold this first actual evidence that Pink Thunder will be available to the world at large soon. I started this project in the Fall of 2006! Lots more news to come. “Florida” – Here’s the First Single from Pink Thunder! 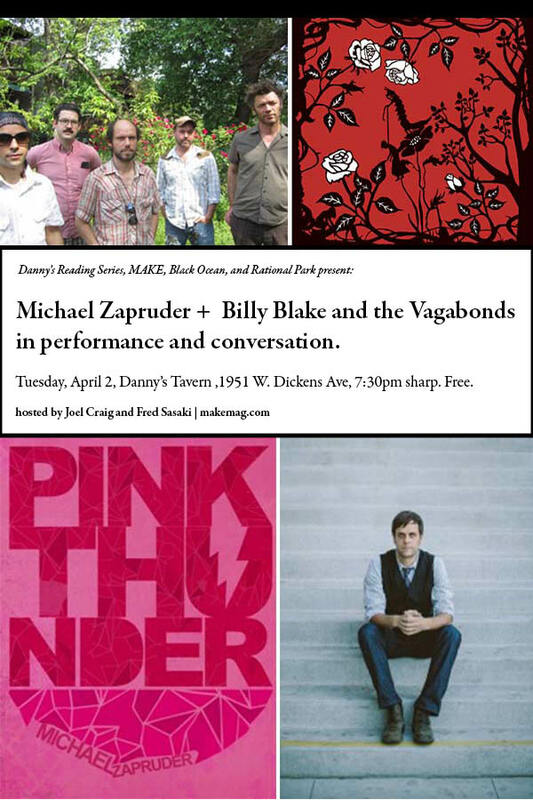 Pink Thunder is all songs I made from poems by living American poets. This poem is by Travis Nichols and is from his 2010 book See Me Improving, published by Copper Canyon Press. Pink Thunder – coming soon! More info very soon, but for now, here’s a peek at the cover by Tony Calzaretta.